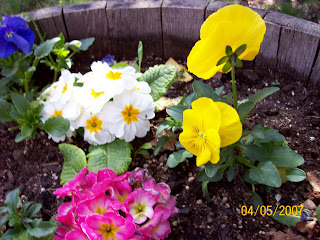 Oh how I do love Spring! 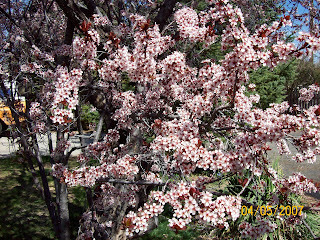 And she sure has Sprung here in Idaho's Treasure Valley. I'm so glad I don't suffer from hay fever, because the air out in our yard is so full of perfume it almost makes me giddy. 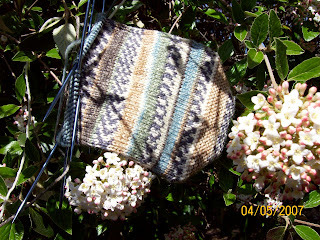 The other afternoon my current sock in progress sneaked off when I wasn't looking and I found it out in the Viburnum bush. Silly sock! 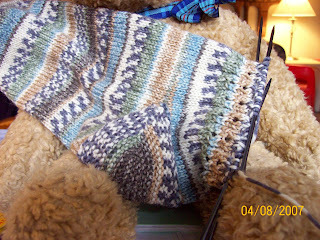 This morning I finished the heel and am working on the ankle rows. I'm doing a garter stitch heel and toe, and I will do ribbing on the leg - want to do something besides just plain ol' 2 x 2 ribbing... I have only about 5 more rows of ankle before I have to decide. This is the first pair of socks I've made with a garter stitch heel and toe - I really like the way it looks and feels. 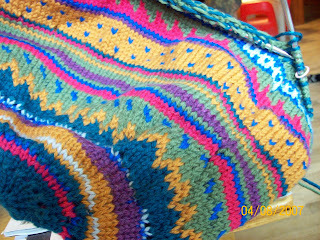 Did I mention how much I love this yarn? 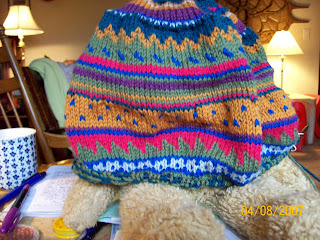 The way the color changes and develops as you knit along has captured my fancy. 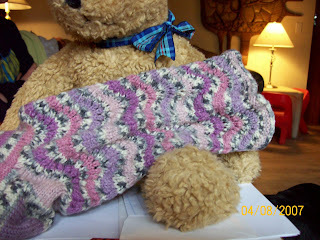 I've also done a few rows on the Fair Isle bag-to-be-felted. I got the pattern from Interweave Knits on what used to be their subscriber-only web patterns, but they're in the midst of changing to something new and right now I can't find the pattern on the web any longer. The only pic I have of it (on my printed pattern) is in black and white and doesn't do it justice, so I won't post it here. I am using 100 % wool from Knit Picks. I couldn't find the exact colors in the Knit Picks wool, but the price was right, and mostly I'm doing this project to see if I can really knit Fair Isle without going bonkers, and also to get some more experience with felting. Later same day - I decided on an eyelet rib for the cuffs of the new socks. Since I haven't already given them a name (except sock-in-progress) guess I'll call them Eyelet Rib Socks. Now, that's original! I'm only on the third repeat of the 8-row pattern so I can't tell how it's going to turn out (compared to a regular 2 x 2 rib) but so far, I very much like the looks of it.